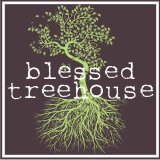 Blessed Treehouse: I'm having a moment. As your loving friend, I will tell you that IT KEEPS GETTING WORSE. Seriously, you think 0-2 flew? HA! 2-4 FLIES. 4-6 ZOOMS. 6-8 goes by at the SPEED OF LIGHT. It's OK. We all go through this, heck my youngest is 4 and I am still feeling this way. It's because we love them and want to savor all the moments. They just go by way to quickly. I am with you in this boat! My "baby boy" turns 4 in March and I could cry just thinking about it! Yikes!